For reasons I’ve never been able to fathom, my boyfriend doesn’t like toast. 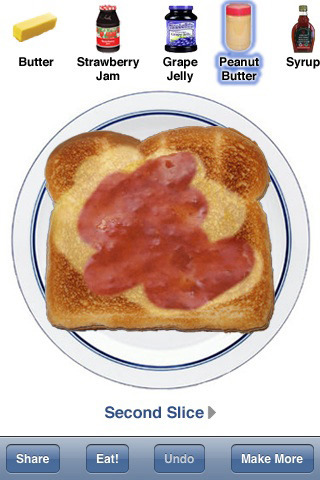 Because of this, the inherent awesomeness of an app utterly, almost religiously, devoted to toast baffles him. He’s a great guy, but I feel sorry for him sometimes, because More Toast is two slices of zany, delightful weirdness. If you’re wondering what all the fuss is about, take a deep breath and try not to overthink it. You have a toaster, a plate, and a choice of bread (or bread-like objects). You toast the bread, and then you are free to let your artistic spirit run free amongst the dizzying variety of toppings, anything from strawberry jam to pickles, (or both, if you’re feeling particularly adventurous). Once your toast has been dressed with your condiments of choice, you can either virtually chow down or be generous and share your culinary creation with friends (with or without your one-of-a-kind recipe). And that’s it. If you have young kids or are the special kind of person who craves a daily dose of silly, More Toast was made with you in mind. It’s simple, almost to the point of stupid, but remarkably robust and full-featured, considering that all it does is make virtual toast. You can customize just about everything. You can choose what color toaster you want, how toasted you want the bread, what kind of plate you want, and I already mentioned the truly absurd number of toppings. And the toppings get individually smeared on according to your discerning taste, all with a refined swipe of your finger. The interface is clean and totally intuitive, and the animations are smooth and precise. Admittedly, it’s not the most, er, intellectually stimulating of apps, but it’s perfect for small children (or easily amused adults). For a cheap, kid-friendly thrill, More Toast is definitely a charming walk on the weird side. AppSafari review of More Toast! was written by Tracy Yonemoto on April 6th, 2010 and categorized under App Store, Food, Fun, Games, Mini Games. Page viewed 5821 times, 2 so far today. Need help on using these apps? Please read the Help Page. I love Maverick Software! Especially More Toast, More Pizza, Cupcakes!, More Salad, and Sundaes!